Our first encounter with Common Bronzewings-Phaps chalcoptera for 2018 was near Kalbarri and they were quite easily found during January in the area, but not easily photographed. Although Common Bronzewings are a large bird of around 33cm and weighing approximately 300 grams with a very wide distribution throughout most of Australia they are not always easily observed or photographed around our home town of Broome. 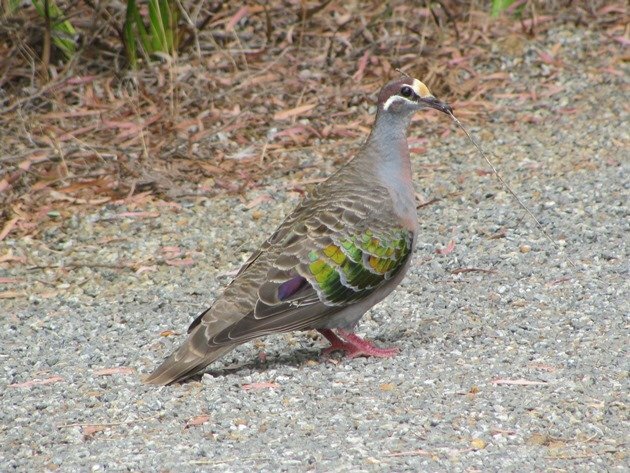 We encounter Flock Bronzewings on a more regular basis, but even that can’t be guaranteed in any particular year. 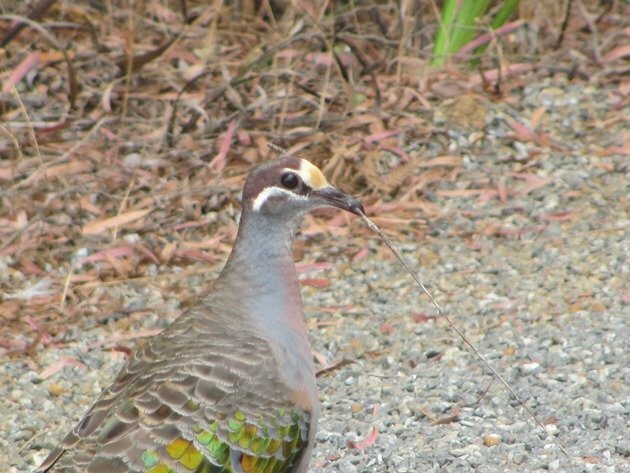 Over the following weeks as we travelled around the more southern areas of Western Australia Common Bronzewings became more common and we encountered them quite often both on the ground and in tall trees. Common Bronzewings feed on the ground and are quite cautious, so it is challenging to photograph them and I have never had much luck. 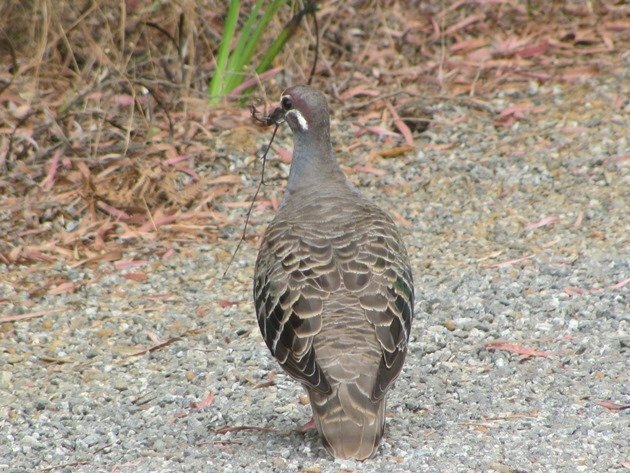 However, on one particular occasion we noticed a Common Bronzewing on the ground carrying a stick, which we presume was to be used for nesting. 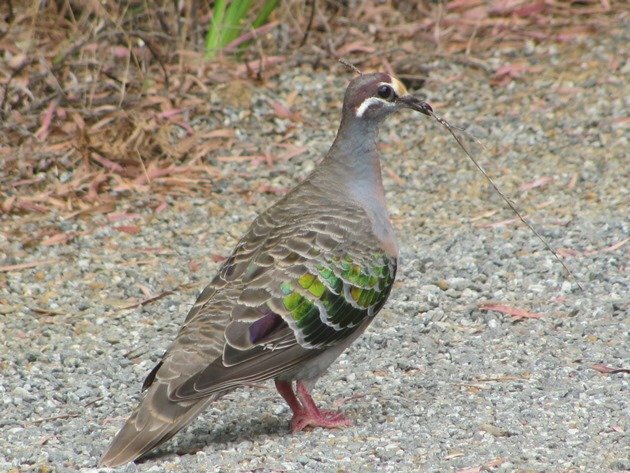 Common Bronzewings make an untidy nest with loose sticks similar to other pigeons and incubation is only about 15 days. The light did not seem particularly good, but from inside our vehicle I was able to take a few photographs without disturbing it and they really did highlight the “bronze wing”. 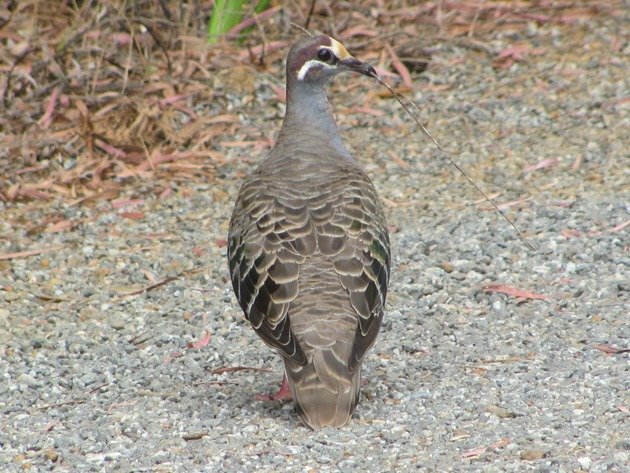 As you can see from the above photographs the back of the Common Bronzewing is very dull and should this bird just be walking away from you or be motionless on the ground you may not even notice it. 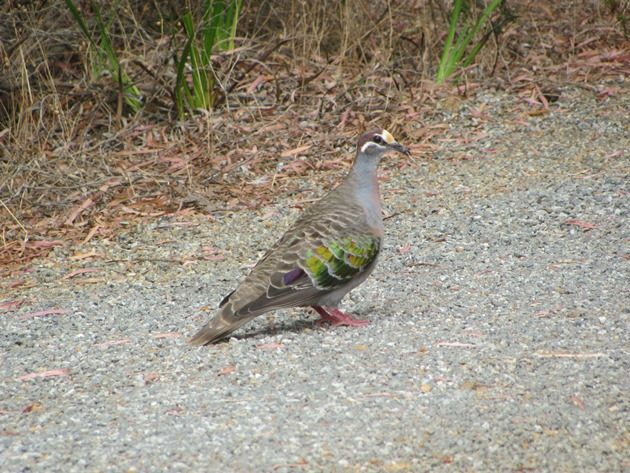 However, when a Common Bronzewing takes flight there is a clattering noise produced by the wings and it is quite an alarming sound. 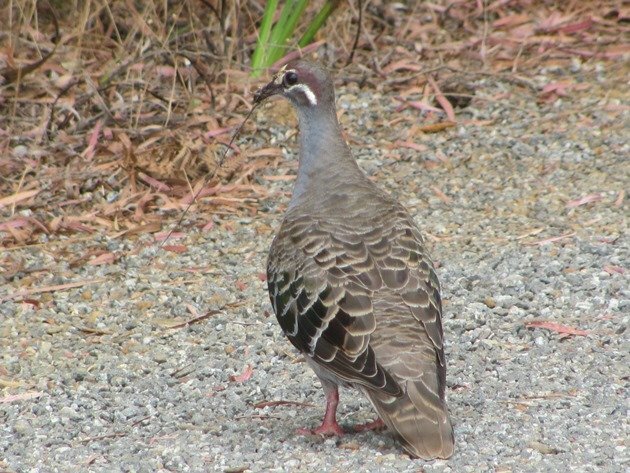 It has been shown that special feathers cause this alarm sound and it appears that only one feather on each wing is responsible in Crested Pigeons. Young Common Bronzewings are not as brightly coloured as male Common Bronzewings and female birds do not have the pale forehead. Sometimes you are just in the right place at the right time and you can photograph a bird that had appeared to be extremely challenging to photograph! Vehicles make excellent bird hides! That is an insane bird! 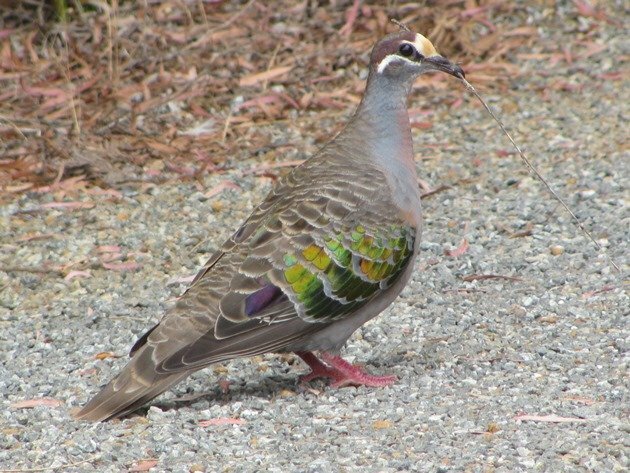 I LOVE the small purple Patch on the tertials, so envious of your doves and pigeons! !